As a mother who lost a child, I want to take a moment to recommend a resource. Stillbirthday is a comprehensive, supportive network, where you can be put in touch with a “mentor” who has lost a child herself (among many other resources). My loss long predates the site’s existence, but I was lucky enough to have a “mentor” myself – a friend with a similar loss who emailed me the entire time I was in the hospital, talking about what she went through, how it felt, what was coming next, etc. I cannot ever express how much this mattered to me, and matters to me still. We formed an amazing bond, and it is one of the most amazing, soothing, helpful friendships I've ever had. This is the first guest post I’ve hosted! Please welcome Cait McKnelly. Kq note: But Science is HAAAARD! I have shared the story of my first son’s life and death inside me, and I have an entire journal about him. 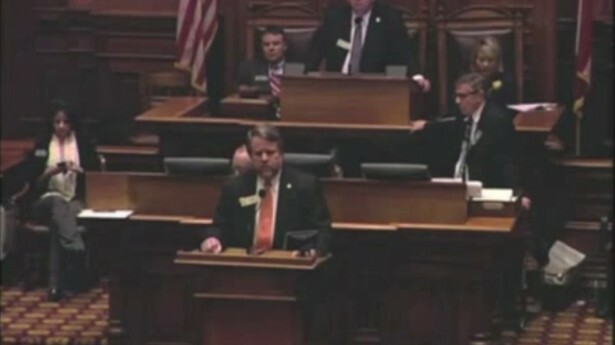 I was just catching up on facebook when a link caught my eye: Georgia Lawmaker Compares Women to Cows and Pigs. I knew it would be enraging, because I cannot imagine how it wouldn’t be. But I also assumed it would be an eye-roller. You know, oh, sure, now we’re just cattle, can’t wait to see this on The Daily Show. But it wasn’t. This one hit so personally that I actually lost my breath. I keep waiting for them to be joke headlines. But they almost never are. Click the picture to go to the video. Grief shows up in strange places, and I guess it never really heals all the way. I, too, am going back home today…It is much farther… it is much more difficult…Tonight…my star can be found right above the place where I came to the Earth…At night you will look up at the stars. Where I live everything is so small that I cannot show you where my star is to be found. It is better, like that. My star will just be one of the stars, for you. And so you will love to watch all the stars in the heavens… they will all be your friends…In one of the stars I shall be living. In one of them I shall be laughing. And so it will be as if all the stars were laughing, when you look at the sky at night… you– only you– will have stars that can laugh! And when your sorrow is comforted (time soothes all sorrows) you will be content that you have known me. You will always be my friend. You will want to laugh with me. You will suffer. I shall look as if I were dead; and that will not be true…You understand…it is too far. I cannot carry this body with me. It is too heavy. But it will be like an old abandoned shell. There is nothing sad about old shells…You know, it will be very nice. I, too, shall look at the stars. All the stars will be wells with a rusty pulley. All the stars will pour out fresh water for me to drink…That will be so amusing! You will have five hundred million little bells, and I shall have five hundred million springs of fresh water…Here it is. Let me go on by myself. It’s been so long since I’ve written here. I guess I’m so caught up in Edward’s life that I don’t have that much time or energy to come back here and remember that short time you were here. It hardly feels real anymore. With all the anti-choice bills going on nationwide, I feel I need to tell my story. The anti-choice people are gaining too much ground, and we have to speak out or else we will lose all our rights. Women don’t have late-term abortions because they changed their mind about having a baby. They aren’t doing it because having a disabled child might be “inconvenient.” They do it out of love. WE do it out of love. My abortion was the most loving thing I did for my first son. A week before the world ended. Your brother is here, safe and whole and alive. He’s so beautiful, I find I can spend hours just watching the tiny flickers of expression that cross his face while he sleeps. It’s overwhelming. He was born on October 29th, all 8 lbs 9 oz of him. It was a very difficult labor and birth, but I’ve been recovering very well–we even left the hospital a day early (which, after a cesarean, is pretty impressive I guess? People sure are shocked anyway). Having him here is hard but joyous; the lack of sleep sometimes gets to one or the other of us (mostly around the time we’re trading off naps). The hardest part for me though is that I obsessively check his breathing while he sleeps. I think more than is normal for a fretful new parent; I find myself leaping up to check him every few minutes when he’s sleeping. The only time I can let down and sleep is when Daddy is awake with him. As long as someone is standing guard I can relax. I am hoping I can learn to trust that he will really stay now that he’s here…he’s been perfectly healthy so there’s no reason to worry so very much. It’s me, I know; I know what it was like losing you, and I can’t imagine how I’d survive if something happened to him too. The panic level overall has gone down now that I can check his breathing, at least there’s that. And, contrary to what people told me–although the sleep deprivation is very hard, it is actually NOT harder having him on the outside than on the inside. I feel healthier now (even though I suspect I might be catching a cold) than I did through the entire pregnancy. I think that’s why the recovery seems so easy; yes, there’s pain around the incision and I’m sore and exhausted, but I can take painkillers for that. I’m not nauseous, my entire body doesn’t ache, and I can stand and walk without awful pain in my hips and back. And I can buy moment after moment free of fear for him by watching that little chest rise and fall. I’ve been terribly neglectful towards you lately. And I really have no excuse; I got pulled off of work a month ago for rising blood pressure (which, magically, lowered when I was no longer stressed out and running around on my feet 8-9 hours a day). I’m on “modified bed rest” which just means staying off my feet as much as possible. It is terrifically boring at times, although it’s nice to just rest when I’m tired (which is most of the time). Your brother is going to be here within the next two weeks; the doctor is going to schedule an induction at our next appointment (tomorrow!) unless I spontaneously go into labor tonight. I doubt that. He doesn’t really seem inclined to leave, although I have definitely reached a point where I want him out. I’m increasingly terrified of the birth. Your actual birth was overall surprisingly easy. You were already gone, so pain relief for me was unlimited. They put the epidural in before they even started the induction, since there wasn’t any particular rush to get you out, and I didn’t need to dilate fully anyway since you were so tiny. There was a several-hour period where the epidural came out and I felt every horrible contraction, but I didn’t have fear of that before it happened. I didn’t have any real fear of the birth, because I expected no pain. And because the concept of pushing your tiny 1lb 7oz self out wasn’t particularly daunting. Your brother is over 7.5lbs and still growing. And I’ve been having off and on contractions for two weeks–they aren’t that painful and they aren’t getting closer together or a whole lot stronger (dammit) but whether I am induced or just go on my own, I will be feeling the contractions for the first half of the labor…and there’s distinctly more terror in how big he is. I don’t like to tell people I’m afraid because a lot of people actually will laugh when you tell them that. Or tell you horror stories. And the flipside–saying how tired and sore and miserable I am still being pregnant (particularly since the terror that, now that we’re actually so close, that something will happen to him), they laugh and tell you how much easier it is being pregnant than having a new baby. So I just don’t talk about much of any of it except to the small handful of people I trust not to laugh. I just can’t bear that good-natured teasing right now. Even though I’m terrified (more each day) of the labor, I really just want it to start so we can get on with things. I got diagnosed with Gestational Diabetes today, which doesn’t surprise me. My pregnancy with your brother has been endlessly difficult; from Hyperemesis Gravidarum to early Braxton Hicks to the pain in my hips and back, not to even mention all the fear and pain and anxiety that he’d be with you instead of with us. That’s still there actually. I try so hard to be bright and cheery about it; a lot of the time I fool even myself. Maybe I’m not fooling myself; maybe most of the time I am that glowing, bright pregnant lady. Today I just feel like I’m slumped. I want to be on the other end of this. I want to stop feeling nauseous, worried, fretful, aching, sore, tired…I don’t want your brother to come early or anything, but I sure wouldn’t be all that unhappy if I wasn’t able to work anymore–at least then I’d be off my aching, miserable feet. This is one of those days where I feel the unfairness of having to go through an entire second pregnancy. I should already be done with this. I should be holding you, soothing you while you’re cutting teeth, seeing you laugh. And I’m so scared, so almost paralyzingly afraid that we’ll lose your brother even this late, both because I can’t bear the thought of losing another son and because the thought of yet another pregnancy makes me feel beyond hopeless. I wish I could hold you. I wish this was over so I could hold your brother. I just noticed that all of the bookmark buttons across the top of my internet window have shifted. For the past year, they’ve been an assortment of support sites, blogs and message boards. Now, there’s a mix of news blogs and baby- and birth-related links. I don’t really know how I feel about you being farther and farther from me. We’ve scheduled our hospital tour, we’re filling out birth plans, the maternity leave paperwork has been mailed, and no doubt within a month the bag will be packed. All things we never made it to with you. Should I be sad? Glad? Grateful? Mostly I’m just bewildered. Enter your email here to follow my blog. A Heartbreaking Choice Supports women who have undergone a pregnancy termination due to a poor prenatal diagnosis, problems with their own health, or for the health of another fetus (selective reduction). All content copyright 2007-2014 Abigail Willson/KumquatWriter.com Any correspondence may be published in whole or in part at my sole discretion unless specified as private. I do not delete comments unless requested by the author. I will make fun of your hate mail.